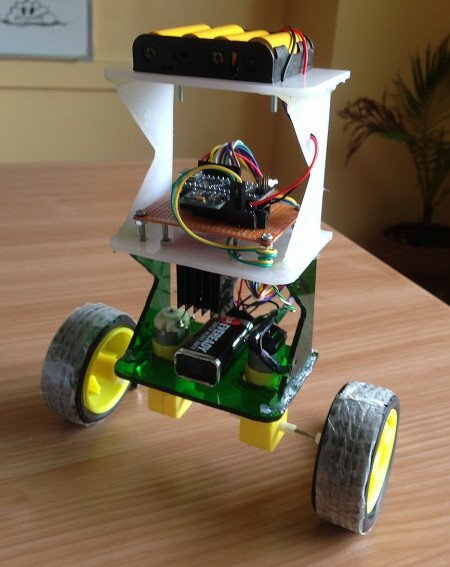 How to use an Arduino to build a robot that balances itself like a Segway. Ever wonder how Segways work? 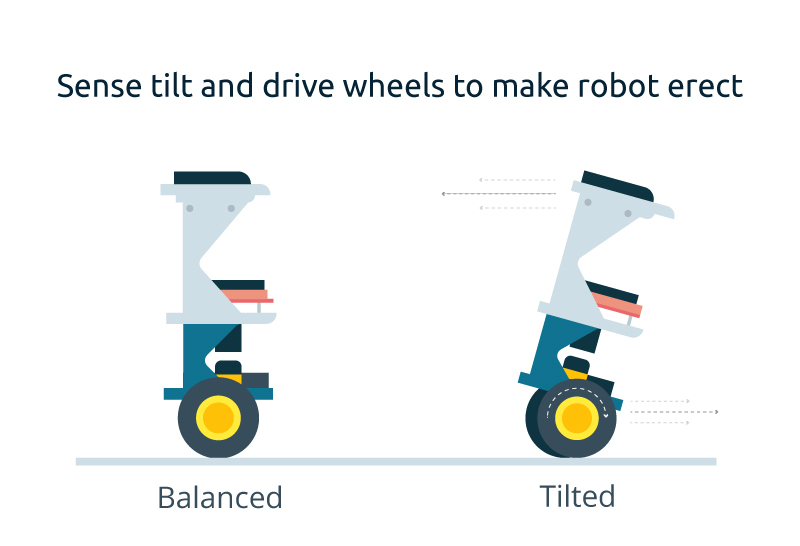 This tutorial will show you how to build an Arduino robot that balances itself — just like a Segway! To keep the robot balanced, the motors must counteract the robot falling. This action requires feedback and correcting elements. The feedback element is the MPU6050 gyroscope + accelerometer, which gives both acceleration and rotation in all three axes. 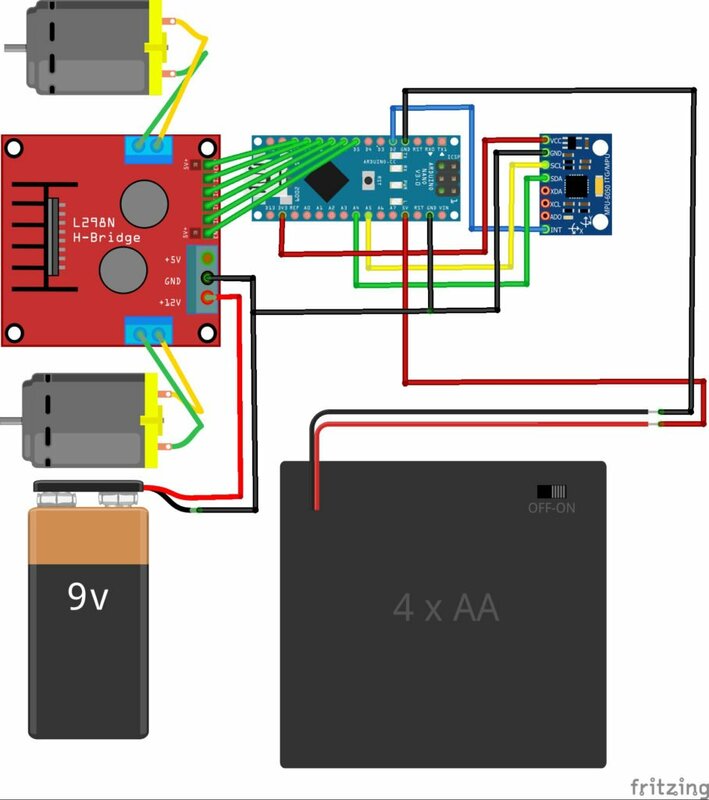 The Arduino uses this to know the current orientation of the robot. 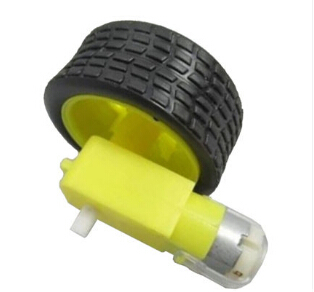 The correcting element is the motor and wheel combination. 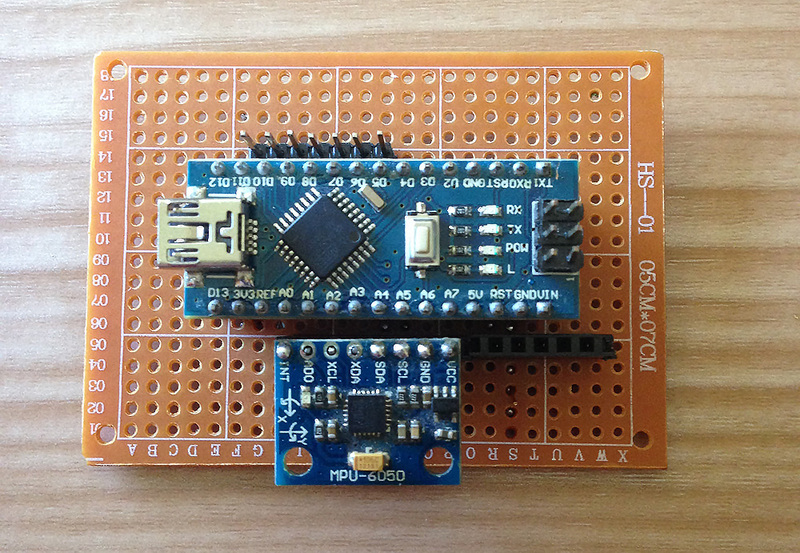 Connect the MPU6050 to the Arduino first and test the connection using the codes in this IMU interfacing tutorial. If data is now displayed on the serial monitor, you're good to go! Proceed to connect the rest of the components as shown above. The L298N module can provide the +5V needed by the Arduino as long as its input voltage is +7V or greater. However, I chose to have separate power sources for the motor and the circuit for isolation. Note that if you are planning to use a supply voltage of more than +12V for the L298N module, you need to remove the jumper just above the +12V input. The self-balancing robot is essentially an inverted pendulum. It can be balanced better if the center of mass is higher relative to the wheel axles. A higher center of mass means a higher mass moment of inertia, which corresponds to lower angular acceleration (slower fall). This is why I've placed the battery pack on top. The height of the robot, however, was chosen based on the availability of materials. 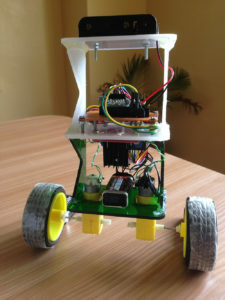 Completed self-balancing robot. At the top are six Ni-Cd batteries for powering the circuit board. In between the motors is a 9V battery for the motor driver. Make Kp, Ki, and Kd equal to zero. Adjust Kp. Too little Kp will make the robot fall over, because there's not enough correction. Too much Kp will make the robot go back and forth wildly. A good enough Kp will make the robot go slightly back and forth (or oscillate a little). Once the Kp is set, adjust Kd. A good Kd value will lessen the oscillations until the robot is almost steady. Also, the right amount of Kd will keep the robot standing, even if pushed. Lastly, set the Ki. The robot will oscillate when turned on, even if the Kp and Kd are set, but will stabilize in time. The correct Ki value will shorten the time it takes for the robot to stabilize. I needed four external libraries to make this Arduino self-balancing robot work. The PID library makes it easy to calculate the P, I, and D values. 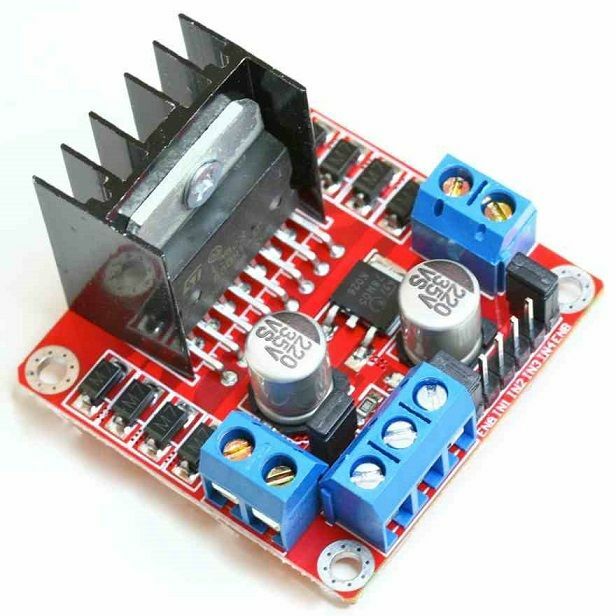 The LMotorController library is used for driving the two motors with the L298N module. The I2Cdev library and MPU6050_6_Axis_MotionApps20 library are for reading data from the MPU6050. You can download the code including the libraries in this repository. My Kp, Ki, Kd values may or may not work you. If they don't, then follow the steps outlined above. Notice that the input tilt in my code is set to 173 degrees. You can change this value if you'd like, but take note that this is the tilt angle to which the robot must be maintained. Also, if your motors are too fast, you can adjust the motorSpeedFactorLeft and motorSpeedFactorRight values. Here's the self-balancing robot in action! 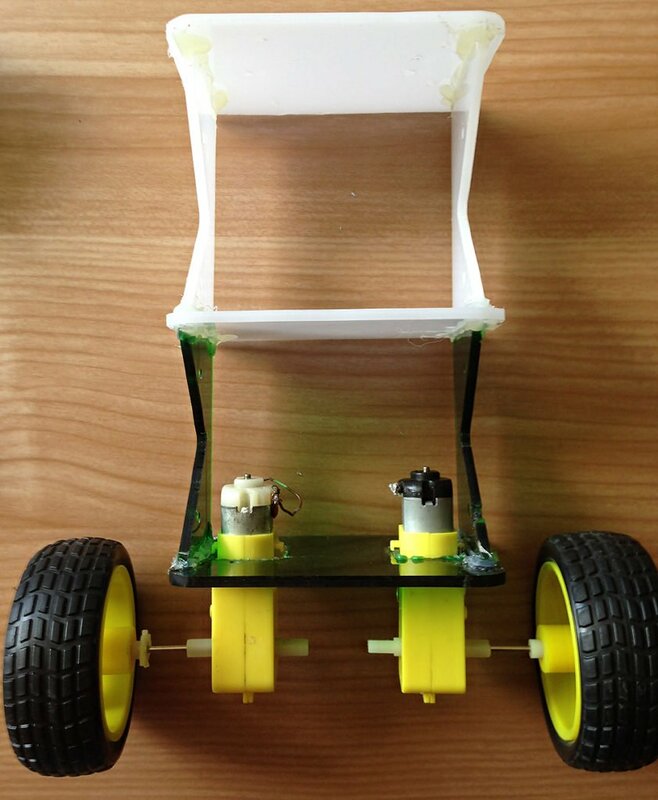 An improvement for this self-balancing robot would be controlling it remotely. Unfortunately, I can't make this robot do that unless I make it ultra stable using DC motors with an encoder. An encoder would update the current speed of the motor, which I can use to make the robot steadier via a second PID loop. I might do that next time, so stay tuned! I love challenging myself by creating new projects using different microcontrollers to see what I can come up with.